Mona B. Vogue Mini Canvas Crossbody | P.C. Fallon Co. 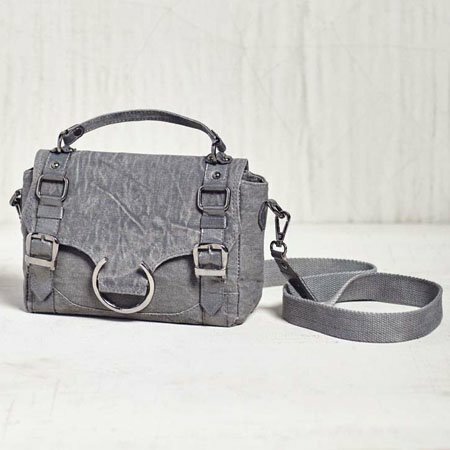 The Mona B. Vogue Mini Canvas Crossbody Bag is a chic upcycled canvas bag constructed with gray canvas and platinum leather with bold metal hardware. The fold-over design features a dual snap closure with decorative buckles. On the back find one exterior zippered pocket. A decorative horseshoe shaped metal hardware accents the front. The detachable cotton webbed crossbody strap measures 25". An optional handle at the top. Interior is lined with signature Mona B. cotton lining, and contains one open pocket. Dimensions are 9.5"w x 6"h x 3.5"d. Made from up-cycled canvas. The fabric shows the history of its travels which may include stitch marks, minor staining and unique scars and bruises. Color variations and patches add to the uniqueness of each bag. Heavy cotton canvas and leather.